China-based manufacturer, which became popular in the past couple of years thanks to offering phones with great hardware at bargain prices, is about to announce its newest flagship – the Mi 5. A highly anticipated device among smartphone fans for two reasons — first, many expect the handset to be sold at a bargain price, considering its hardware and premium looks; secondly, it may (and we would like to emphasize the “may” here) be the first smartphone that Xiaomi sells internationally. So far, there have been a number of leaks talking about hardware, possible features, camera prowess, and revealing the alleged looks of the upcoming handset. 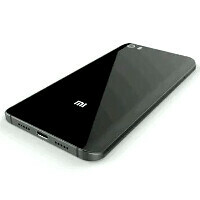 A graphic designer gathered the latest leaked images and made a concept render of what the Mi 5 may end up looking like. What we see is a smartphone with a metal trim, sandwiched between two glass slabs. Its back corners are arched for better ergonomics. That look may remind you of Samsung's Galaxy Note 5 or the renders of the upcoming Galaxy S7, but we would like to point out that the curved glass on the back is something that Xiaomi used on the Mi Note and Mi Note Pro, which were announced back in the beginning of 2015. However, that hardware home button below the screen is, indeed, atypical for Xiaomi and reminds us of... someone else's smartphones. As far as rumored specs go – leaksters say a 5.15-inch display with a 1080 x 1920 pixel resolution and a 64-bit, octa-core Qualcomm Snapdragon 820 SoC, clocked at 2.15 GHz . Unfortunately, there's no solid word on memory or storage. What we are expecting is at least 3 GB of RAM and 32 GB of internal memory. Excited to see the Xiaomi Mi 5 in the flesh? It's about to be unveiled on the 24th fo February at the MWC and we are definitely going to be getting a closer look! Good enough! And may i add that this is the first phone rumored to come with WiFi ad protocol! There is an LeTV phone with WiFi ad already. Anyway, it won't matter as the 5 GHz band still has a lot of life left in it, and we don't have internet speeds to utilize it's full potential yet. WiFi ad won't be useful until you have over 1 Gbps internet speeds, since 2x2 WiFi ac supports 800 Mbps easily. I doubt even then ad will be useful as its range is not so great..
snap 820 is octa-core or quad-core? Combination between Samsung and Apple.